Our little pocket of the South of France has really shown us how quickly the seasons can change around here. A week ago, we only just made it out of our road, through snow as deep as my five year old is tall and temperatures below zero. And this afternoon, the day after coming home from our road trip, we sat outside in the sunshine and enjoyed wearing only two layers (not our usual five) in a toasty 13 degrees. 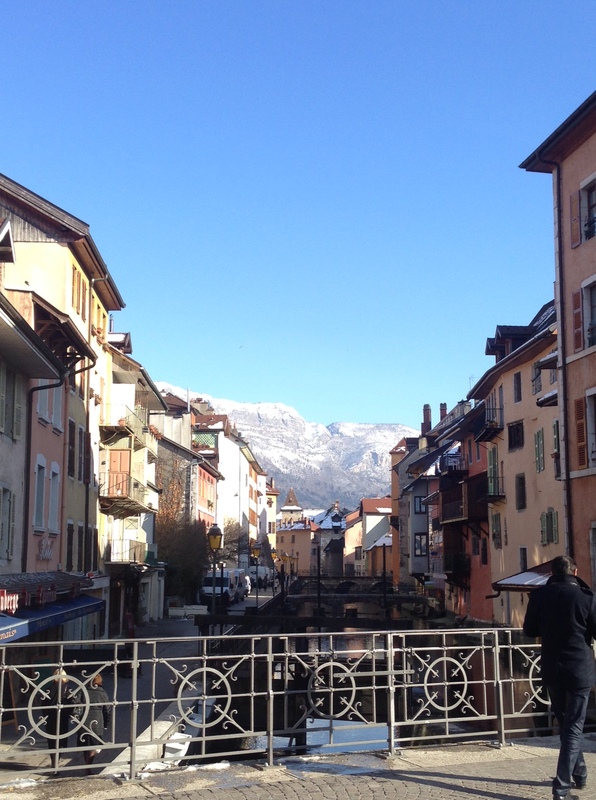 We took advantage of the kid’s school holidays and drove to Grenoble to stay with a friend. Five years ago when I started to welcome au pairs into our home in Australia to help me cope with three children under two years of age, I never knew the depth of friendships we were creating, and how well these girls (and a guy in there too!) would get to know and love our family. What a treat it has been to continue our wonderful connection with some of these young ladies in their home country. 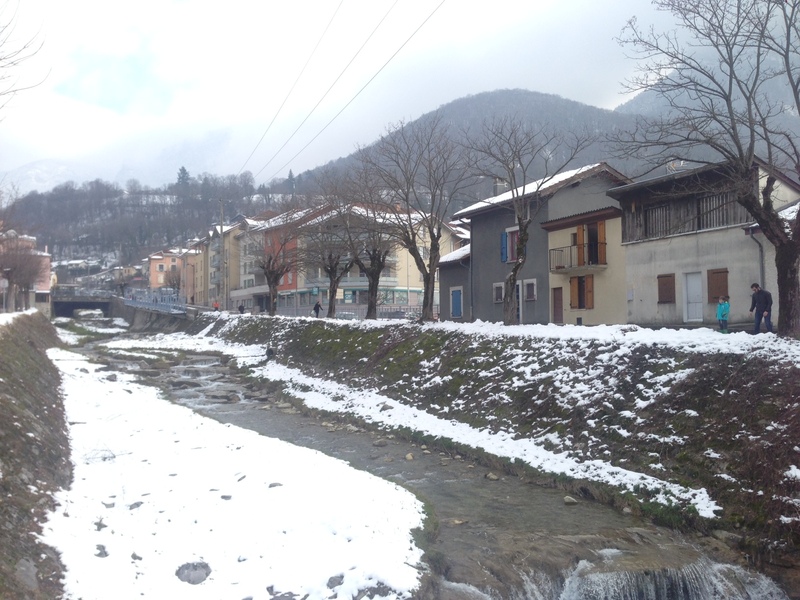 We were invited to spend a few nights in a small town called Voreppe, just out of Grenoble and an hour south of Lyon. It cemented for me two things: I much prefer to spend time in smaller villages and towns than larger cities; and you can’t pay for the experience you get when you are hosted in a family’s home and are gifted the opportunity to see how a real French family lives, day to day. We were well and truly spoilt for space, comfort, good food and wonderful conversation, despite the challenges of a language barrier. Our friends really went all out to show us their “specialties of the region”. So much so that we ended up having a joke at each meal time about how if something is a “specialty of the region”, it must be eaten, no matter how much fat or sugar is involved. We happily agreed to share in the specialty of the region for January – a croissant consistency pastry that was laced with praline walnuts. The kids thought it was Christmas when this was served for breakfast! And as there is a specialty patisserie product for each month (brilliant marketing or respected tradition??) we also had to sample February’s bugnes. These are sweet, crunchy pastry layers that taste like they’ve been deep fried – but in a good way – and dusted with icing sugar. They’re delicious and delicate and indulgent and leave me feeling like the French have a secret I don’t know about or an iron will that keeps them thin. Incredible how they resist these temptations. I’m sure there is a gene in a French person’s DNA that doubles their rate of metabolism – it just doesn’t make sense. 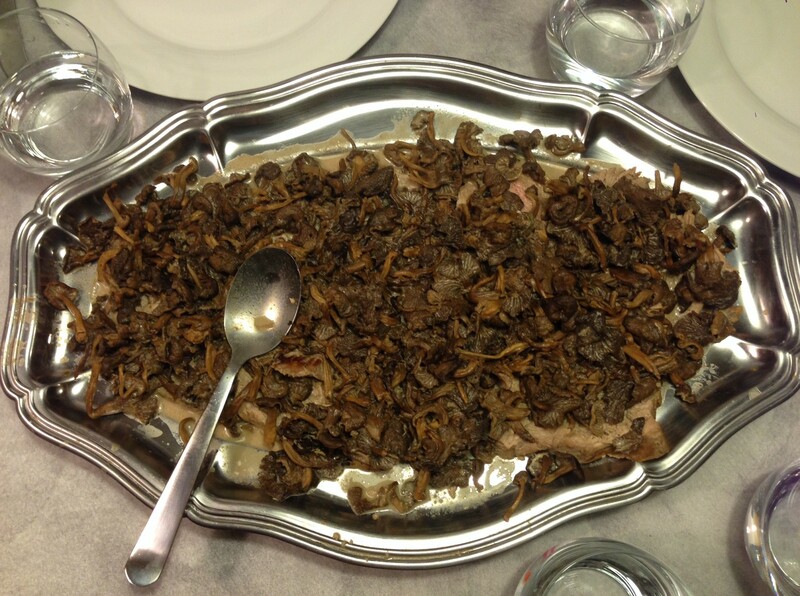 The best dishes were the traditional French dinners they cooked that included Roti de Veau aux Chanterelles (Roasted Veal with Chanterelle Mushrooms in a Cream Sauce – best bit about this dish was that the mushrooms were hand picked from the forest and dehydrated at home! ), Pommes de Terres Dauphinoises (Potatoes Dauphinois), Boeuf aux Carottes (Slow Cooked Beef and Carrot Casserole) and a dish I’d never seen or heard of before called Quenelles. 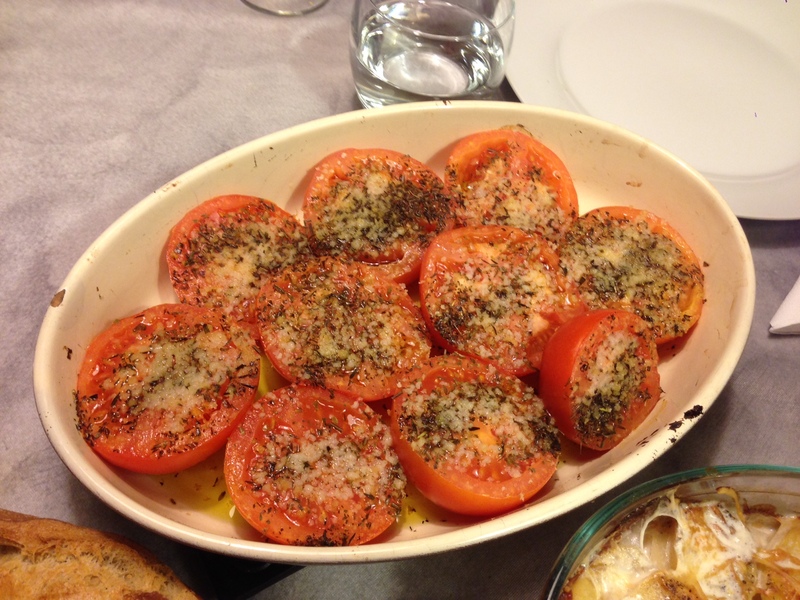 The best way I can describe these are a cross between gnocchi and cannelloni or boiled bread dough and pasta – they soak up whatever you cook with them and in our case, it was a simple and very tasty tomato and olive sauce. Interestingly, when we ordered these a few days later in Lyon, they were made from fish and had a consistency similar to tofu. So I’m left thinking there are at least a couple of versions. Both were yum. What struck me most is the simplicity of how the French eat. You even see it on their restaurant menus. As an example, Boeuf aux Carrottes. Beef with carrots. No apology, no fancy dress-ups, just humble food served with love. What the untrained palette may not realise however, is that the dish is slow cooked, sometimes over two days. And most French people have been taught the art of saveur (flavour) so that a generous amount of garlic is used, the right herbs are added at the right time, and they are never shy with salt and pepper (I rarely need to season food after it’s served). And of course with each main meal we are first offered a salad and before dessert, a plate of heavenly cheeses. I swear I will never tire of tasting new cheeses. Charles de Gaulle once said that “a country with over 350 kinds of cheese is ungovernable”. Well, I’m afraid I don’t need to worry too much about the government here as it will probably never effect me directly. 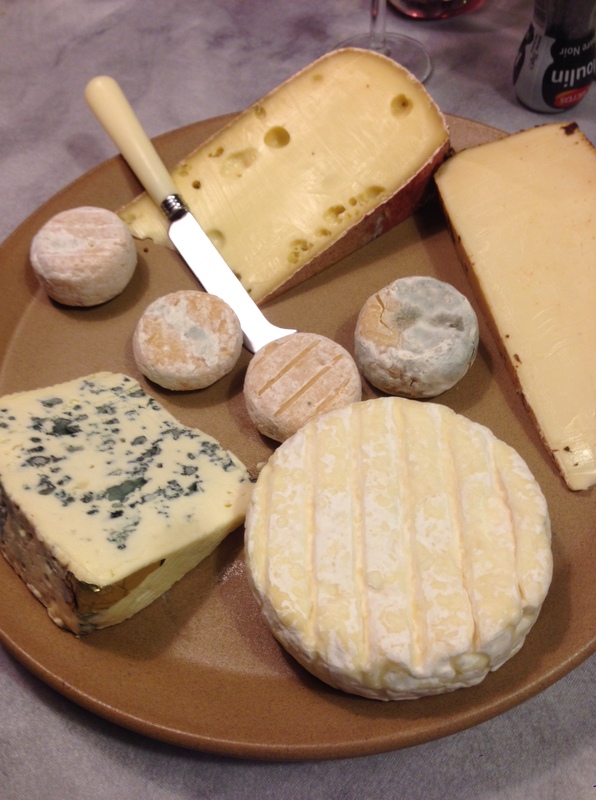 So until such a time, I will push on in pursuit of those 350 kinds of cheeses, and be grateful for each morcel. 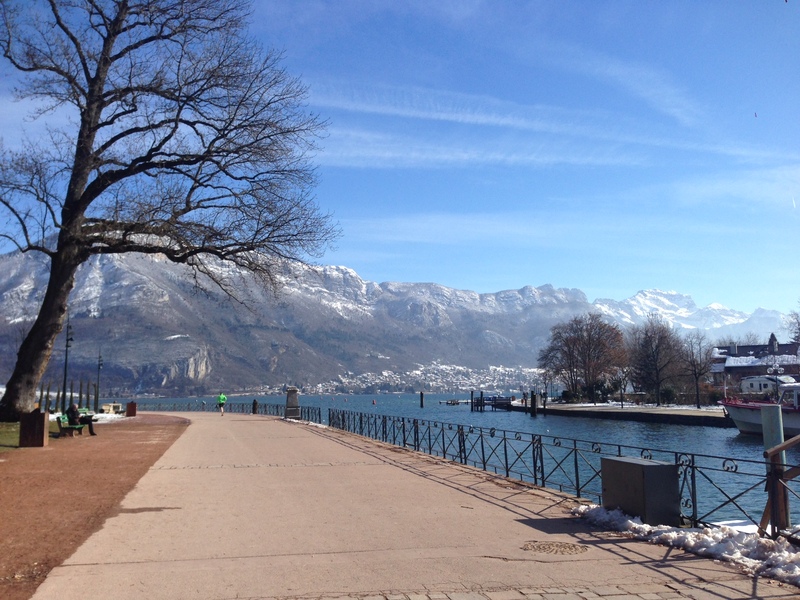 Speaking of cheese, we went on our friend’s recommendation and took a day trip to Annecy, an hour and a half from Voreppe. 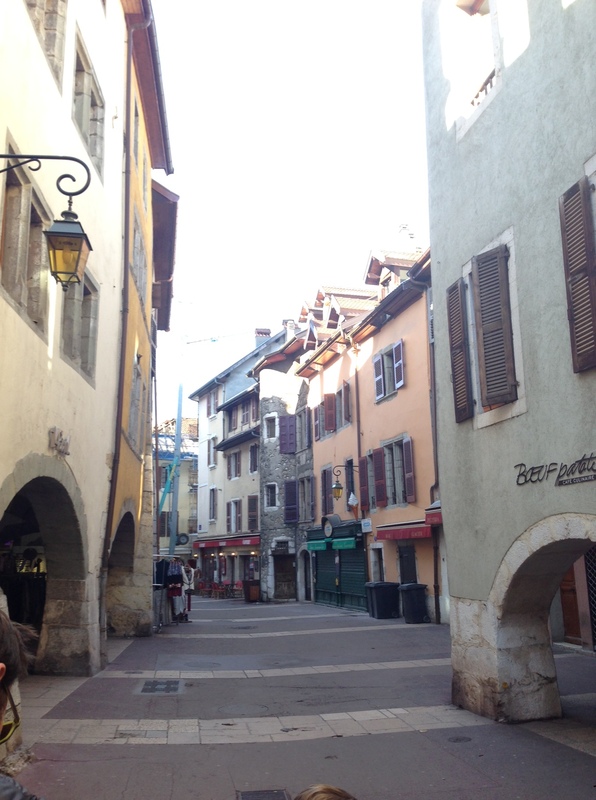 It’s in the Savoie department and is the home of the original cheese fondue. I’d seen it on the map before and knew it was close to the Swiss border, but other than that, I was grateful for someone else to play tour guide and show us around. What an unexpected delight! 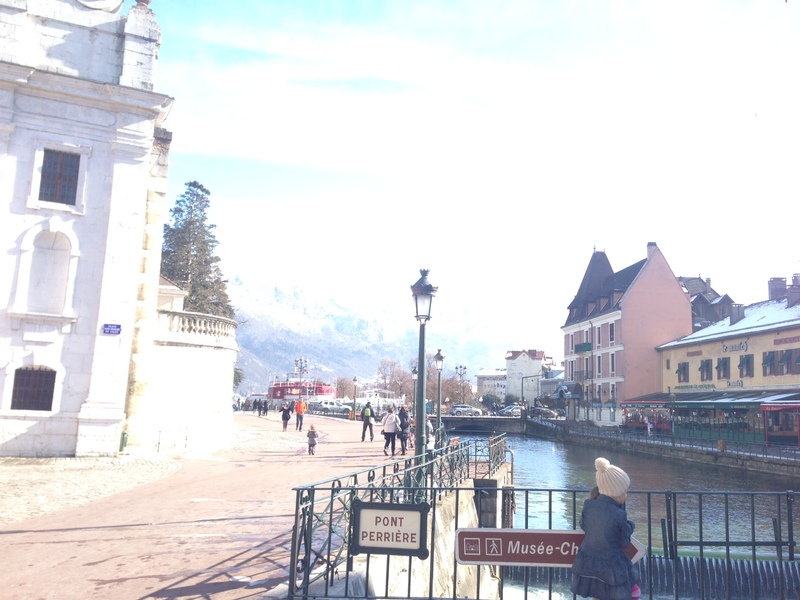 It’s by far the prettiest city I have seen in France so far and the most unique given it borders France’s third largest lake and juts up against the mountains, giving us ample opportunities to take some breathtaking, postcard-worthy photos. The architecture reminded me of Switzerland and the canals through the old town reminded me of Venice, but it was the cheese fondue we ate for lunch that reminded me of being a kid again! I had a great time, swirling various charcuterie cuts, fresh rye bread and pickles through the thick, gooey cheese, that was both sweet and creamy all at once. I had to fight off the kids to ensure my fill. That meal will be one we remember, punctuated by how cold it was outside despite the brilliant blue sky and sunshine, and how warm and cozy it was inside the Savoyard restaurant. A brilliant day. 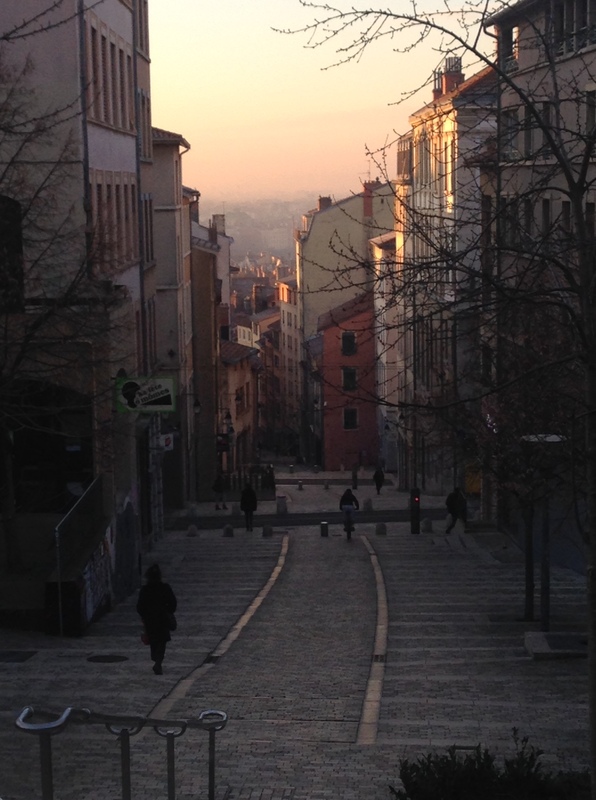 After Voreppe and Grenoble, we ventured in to Lyon. It reminded me of braving Paris by car a little. It is a very densely populated city, although this was only apparent to us by buildings and cars, not necessarily people. 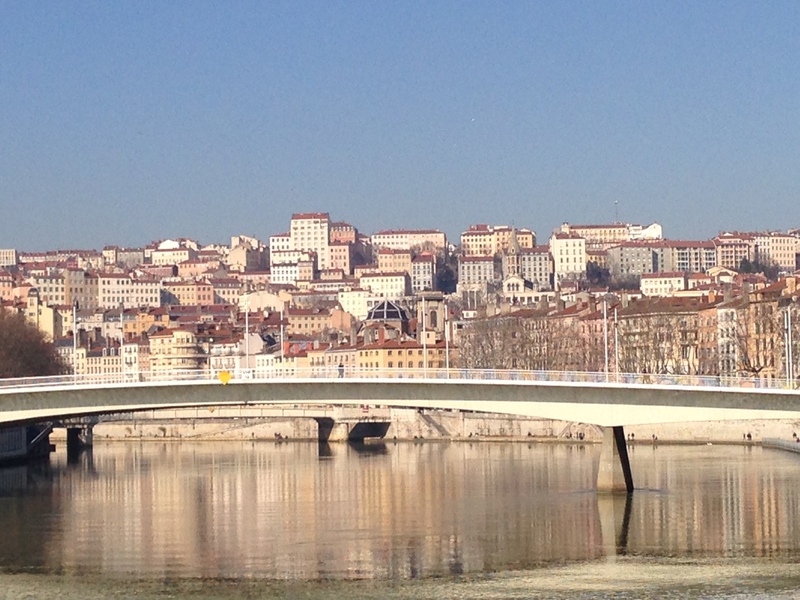 Lyon is France’s “second city” or the “city between two rivers”. The waters of the Rhone and Saone mucked up my usual stellar navigation. We stayed in the Croix Rousse district which was probably just as well. It sits very high up on a hill overlooking the city – breathtaking views on a clear day – and meant we could squeeze plenty of high intensity training into our days of eating. Histroically, the area was famous for it’s artisan silk weavers. Les Pentes are the famous stairs that take you from the city centre to the top of the hill in twenty minutes depending on your fitness levels. Driving would probably take just as long once you deal with the horrors of parking, zigzag turns and miniature roads that spit you out at one end only to confuse you with endless one way streets as your next option! I read up on Lyon before we arrived – I am always keen to find out what the food specialties are of each region. One thing France does well, is clearly define which regions own the origin of certain products. And from all the reading I did, the theme I picked up was meat, meat, meat. This quote from an article in The Guardian summed it up perfectly: “In a dining establishment in Lyon, you can eat pig fat fried in pig fat, a pig’s brain dressed in a porky vinaigrette, a salad made with creamy pig lard, a chicken cooked inside a sealed pig’s bladder, a pig’s digestive tract filled up with pig’s blood and cooked like a custard, nuggets of a pig’s belly mixed with cold vinegary lentils, a piggy intestine blown up like a balloon and stuffed thickly with a handful of piggy intestines, and a sausage roasted in a brioche (an elevated version of a “pig in a blanket”).” The only thing I would add to this is pig trotters, which appeared on more than one menu I read. I am indeed a meat lover, but the Lyonnaises takes it one step further. I must applaud them for owning the “head to trotter” philosophy and not wasting any beast’s innards, but I wasn’t in the right stomach-space to go forth and sample all these local delicacies. Mike managed an andouillette one night (a sausage made from pork intestines) and enjoyed it – I did taste the very rich dish and didn’t mind it, but I did prefer my simple chicken and mushroom dish. The charcuterie is a different story altogether – we sampled some sensational rosette salami and brought more home – it didn’t last a day. And for the first time since arriving in France, we walked Vieux Lyon (the old town) holding Nutella crepes, which are an institution anywhere in France. It wasn’t quite as romantic as I’d envisaged with three kids faces resembling those of “vegemite kids” gone wrong, but the washing was worth the memory. Preheat the oven to 180 degrees and prep all your vegetables. Start with the sweet potatoes, and get them on to boil. Once they’re very soft, add the milk, a tablespoon of butter and a pinch or two of salt before mashing. Set aside. Heat a large frypan with the remaining butter and oil and saute the leeks, onions, garlic and bacon for five minutes. Once softened, add the carrots, celery and mushrooms to cook for 5-10 minutes before adding the red wine. 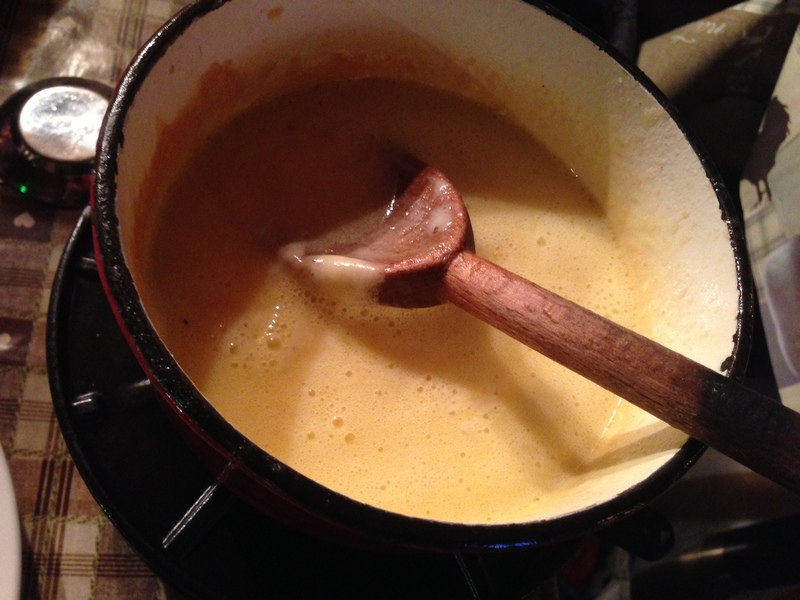 Allow to simmer vigorously until the alcohol has evaporated and the liquid has thickened slightly. At this point, I transfer the vegetables to a larger cooking pot to accommodate the remaining ingredients. Combine all remaining ingredients except the broccolli (these need to be gently steamed separately) and add the stock and water. Stir to ensure all ingredients are coated and lower the temperature to a medium level. Cook for 20 minutes until the carrots are just starting to soften. Stir regularly and add extra water if needed. Once cooked, transfer to a large baking or lasagne dish and top with the mashed sweet potato. Smooth the mash over the top to create a “crust”. 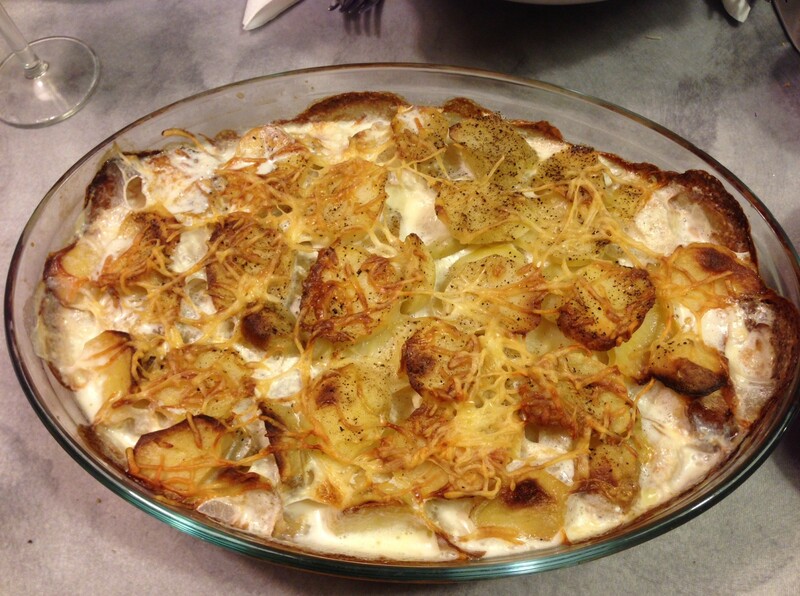 Sprinkle with the grated cheese and flaked almonds and cook until the top is golden – approximately 30 minutes. Serve with steamed broccoli florets. Categories: Food | Tags: annecy, charcuterie, cheese, dinner, France, grenoble, lyon, meat, pastry, saucisson, vegetables, vegetarian | Permalink. I accidentally just made a great salad. It was an accident because it includes lentils which I usually avoid. The bottom line is that I’m about to serve duck for dinner with a side of lentil salad … I’m sure I’ll come up with a more creative name for it by the time I’ve finished writing this post but that’s what we shall call it for now. So what’s the show you ask? A series of SMS messages coming at me every minute or so from my husband who is currently sitting at the Limoux piscine (piscine = pool: I use the French translation because it’s his favourite french word). He very gallantly volunteered to help with swimming lessons for the kids school in May. His help was gratefully received … and then they sent a note home. So, as you can tell, I may be inflating this story just a little, but the officialdom around ten swimming lessons in a country school for no more than 27 students is slightly amusing. One thing is for sure, I will not be nervous about my children participating … I think their safety needs will be well-covered. Allow me to double back to the type of swimwear that parents were asked to wear … just in case you missed it. If a good-looking Aussie guy walks into the pool trying to wear boardies, he will be forbidden to swim. This is what we had heard, so I decided to double check with our go-to man here in our little village, Monsieur le Mairie. He answered me in French and said “yes that is correct, you need to wear tight swimming costumes, although a lengthier short is allowed, so long as it is tight. And he must also wear a rubber duckie around his waste.” He said this to me with a straight face so it took me a second to appreciate that he too found the requirements a little stringent. Nevertheless, it meant hubby had to take a trip to town to invest in some tight togs so he didn’t offend. Let it be known that I did not assist him on this particular shopping trip. All photographic evidence that I tried to collect of his black and fluro pink (yep, that’s what he bought) swimming shorts has been destroyed. Hubby has a background in security so there’s no way he was going to let those photos slip through his grasp. I’m not sure why he felt he needed fluro pink shorts, but all I got by way of explanation was “they looked red in the store … they were definitely red when I bought them” from a very grave looking face indeed. So imagine the show I enjoyed when he proceeded to keep me updated on the whole hilarious night via SMS while it was actually happening. His french is improving so he picked up a phrase here and there. They covered a policy that was created in 1937 and is still effective today. Really?? They drew stick figures so all the parents could understand what the swimmers would be taught. And they explained that any “helper” on their mobile phone WHILST in the pool would not be covered by insurance should anything happen to a child on their watch. Gee I’m glad that was covered – now it’s clear. So back to dinner … duck is very popular here in France. And they’re huge! I don’t really want to know why they’re so huge; all I know is that they taste amazing and it is by far my favourite meat dish here. I’ve been practicing cooking duck breast quite a bit since we arrived so now I think I have it just right. 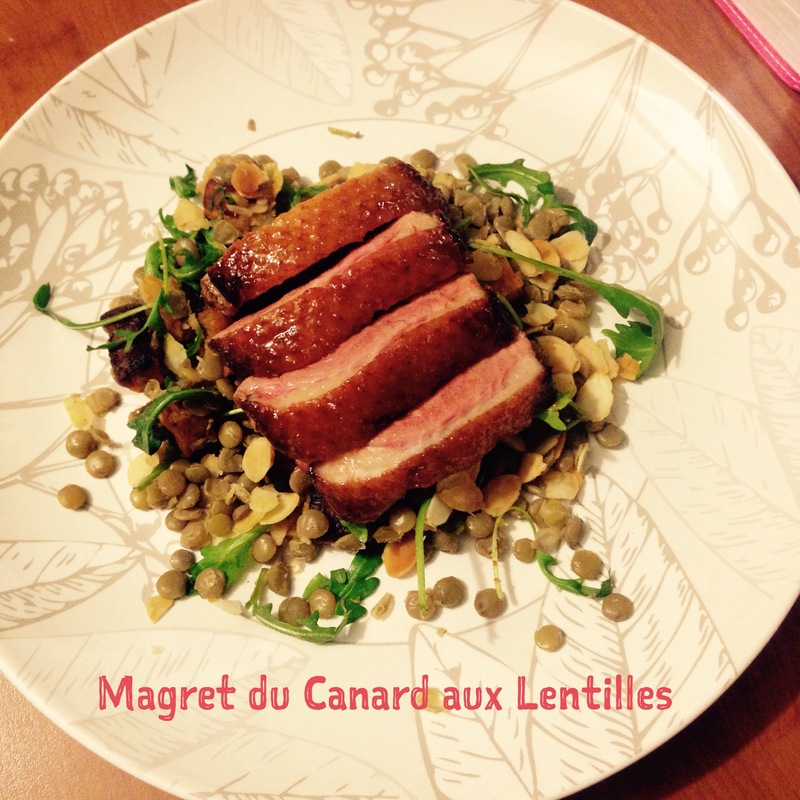 Here’s my recipe for duck breast and lentil salad. If I just change it to French, I have my exotic title: Magret du Canard aux Lentilles. Perfect! Preheat the oven to 200 degrees, fan forced. Put a large saucepan on to boil with the lentils and 2 cups of water. As soon as the water boils, turn down the temperature to facilitate a gentle simmer for a further 20 minutes. Add the cumin to flavour the water. As the oven is heating up, put the slivered almonds in to brown for 5 minutes and cube the sweet potato. Once the almonds are brown and fragrant, roast the sweet potato cubes for about 30 minutes with coconut oil, salt and pepper. Prepare the duck breast by drying it in a paper towel. Rub salt into the fat and turn a large frying pan on high heat. Cook the duck breast fat side down to render the fat for about 5 minutes. It should be a lovely golden colour. Remove from the pan and place on an oven tray, fat side up. Drizzle the honey over the fat and place in the oven to finish for about 15 minutes. Turn the oven down to 180 degrees as you put the duck in. Keep the duck fat left in the pan for tomorrow night’s roast potatoes! Meanwhile, add salt to the lentil water just as it’s finishing, and drain. Add to a bowl with the rocket and almonds. Add the sweet potato once it’s cooked and caramelised. Dress the warm lentil salad with olive oil and vinegar, salt and pepper to taste. Toss and serve. The duck breast should be a dark pink to pale brown colour. Slice diagonally and plate on top of the lentils. Bon appetit! Categories: Food | Tags: dinner, duck, France, french, graceandgusto, graceandgustofood, lentils | Permalink.